Narwhals and walruses would be the most at risk. The expected growth in Arctic ship traffic is likely to affect marine mammals in the region, but those impacts will vary from species to species, as well as from one area to another. And gaps in research mean that uncertainty remains about how some of those impacts will play out. Those are the findings of a new study just published in the journal Proceedings of the National Academy of Sciences, aimed at figuring out how increased shipping will affect seven species of marine mammals as Arctic waters become increasingly ice free in summer months thanks to climate change. The study found narwhals, which were both more exposed to shipping routes and more sensitive to impacts, to be the most vulnerable species. It also found that populations near features that concentrated ship traffic into narrow lanes — such as the Bering Strait and parts of Canada’s Northwest Passage — were more vulnerable than populations elsewhere. “There’s a wide body of research at lower latitudes that shows that [vessel traffic] effects marine mammals. We have the opportunity now to prepare for the future, as vessels start using these newly assessable routes in the Arctic,” said Donna Hauser, lead author of the study and a research assistant professor at the University of Alaska Fairbanks. Along with this exposure score, the authors also calculated how sensitive each subpopulation could be to marine traffic using seven variables. These included how often the population would be exposed to vessels, if there were threats for acoustic disturbances or vessel strikes, how large the population was and if it was increasing or decreasing in size. These two calculations went into the authors’ vulnerability score for each subpopulation. They found that 53 percent of the 80 subpopulations would be exposed to vessel traffic in either the Northwest Passage or Northern Sea Route (or both) in September. Narwhals were the most vulnerable marine mammal species, with the Eclipse Sound population the most vulnerable subpopulation. Walruses were the next most vulnerable, followed by bowhead whales, while polar bears and ringed seals had the lowest vulnerability of all species studied. 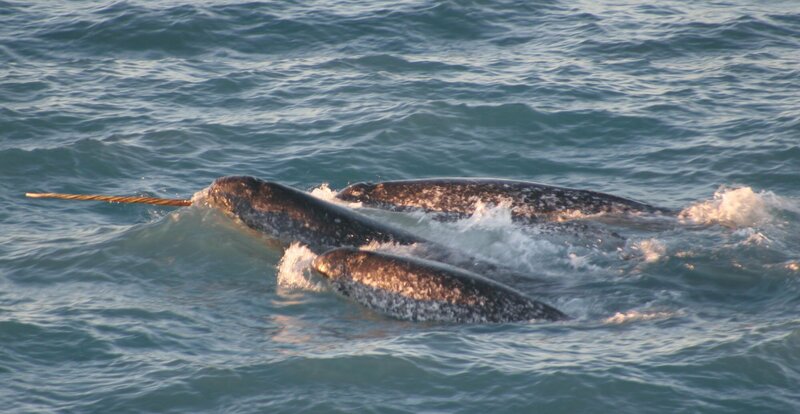 Narwhals’ restricted range makes them particularly vulnerable, as well as their overlap with shipping routes and sensitivity to disturbance. Polar bears are largely on land during September and have less sensitivity to sound, traits that help keep their vulnerability scores low. But, Hauser pointed out, that these scores may have been different if they focused on other months when the polar bears are closer to the shipping routes. The paper also mentioned the uncertainties surrounding some species due to a lack of data and information about the animals’ behavior. The seal species scored the highest and second highest in that measure, followed by polar bears. “It’s a broad brush for a number of reasons, probably the main one being we don’t really have the data yet for some of these species; some of these are really poorly documented,” said Peter Boveng, program leader of the Polar Ecosystems Program for seals at the Marine Mammal Laboratory. This lack of data is a common theme in Arctic research, with its high price tags and remote locations. And certain species, including seals and walruses, are simply harder to study, said Boveng. Because of its focus on an open-water month in the Arctic, the study also didn’t look at the impact of icebreakers on some of these species. Disturbing the ice could have more of a negative impact on seals and polar bears, especially during their breeding, molting and foraging periods. “One can imagine that not all shipping is going to happen in September and there could be cases that, to make the use of the shipping route economically, perhaps there will be more icebreaking in the early or late season,” said Boveng. Ship traffic in the Arctic is expected to rise in over the next decade, as companies take advantage of a more direct route between Asia and Europe and North America and as Russia develops more Arctic oil and gas fields. 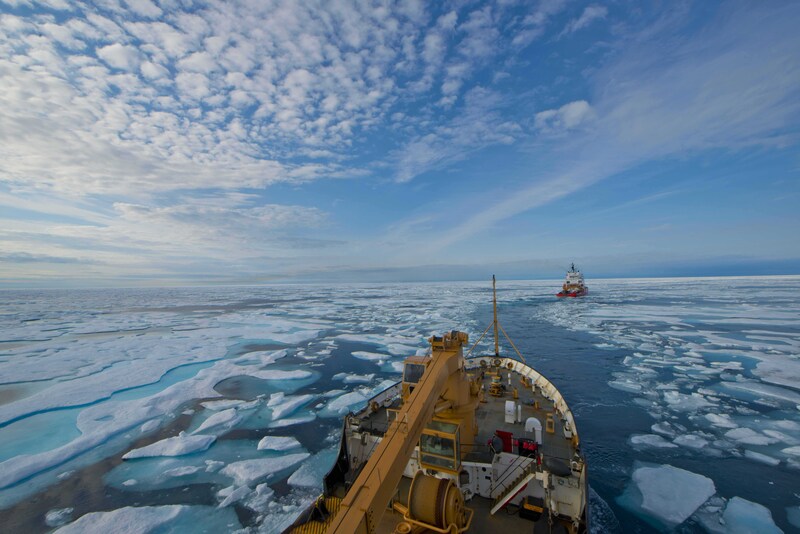 “I consider ship traffic as by far the greatest environmental challenge in the Arctic Ocean. Bigger threat than oil and gas,” Paul Wassmann, professor at UiT The Arctic University of Norway, wrote in an email. And while this study is a good start to understand the impacts of that increase on marine mammals in the region, both Wassmann and Boveng said that other impacts these ships might have on the animals — from leaking chemicals to potential oil spills — should be considered. “It’s very difficult to put a number on those things, but they certainly come with the territory,” said Boveng.